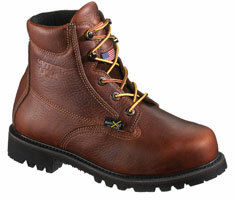 This boot collection features PORON XRD Extreme Impact Protection. The collection includes 6- or 8-inch steel-toe, electrical hazard safety boots made with a full-grain tumbled leather upper; an abrasion-resistant mesh upper lining; and a cushioned, removable foot bed. The PORON XRD M-Guard is an internal, flexible metatarsal guard that provides repeated impact protection along the instep of the boot.